The conference is dedicated to all aspects of superstring, supergravity and supersymmetric theories. It will include four invited review talks and shorter research talks. This is the XIXth edition of a series of meetings created within a European network and the first conference of a new COST program, the MPNS COST Action MP1210 The String Theory Universe. Update (27.08): Registration is now closed! Registration is still open, but requests for talks are no longer accepted. The registration fee for this conference is CHF 290 (approx. EUR 240). This includes the costs for coffee breaks, the reception on Monday and the conference dinner on Thursday. The conference will take place in the physics building of the University, next to the nice old town of Bern, with the support of the Albert Einstein Center for Fundamental Physics. Accomodations: participants may use the hotel list on the corresponding page. Copyright (c) strings13. 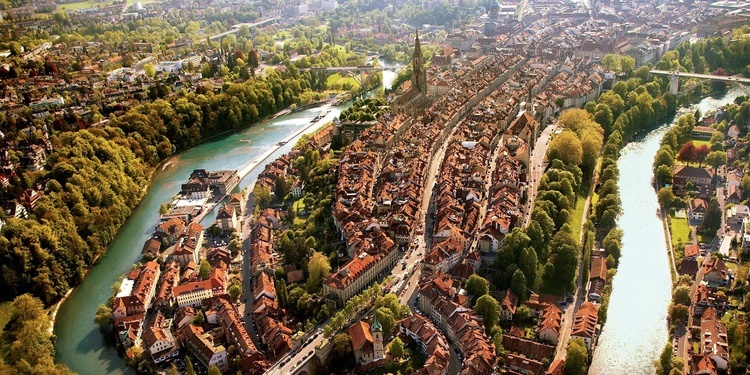 Image Copyright Bern Tourismus. All rights reserved. Design by Free CSS Templates.